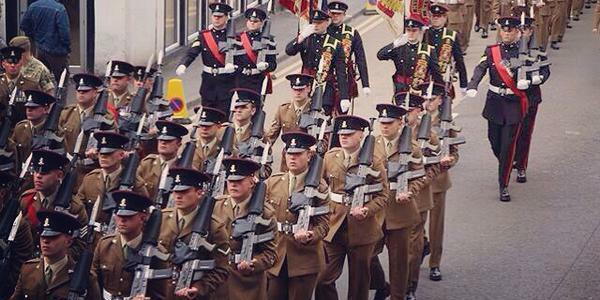 On Saturday 20 June there will be a Freedom Parade through the streets of Huddersfield by The Yorkshire Regiment. The parade sets off from St John’s Road at 10.50 am, with a ceremony outside Ryman Stationers at 11.00 am. At the end of the ceremony the battalion will parade ‘with bayonets fixed, colours flying and band playing’. More than 100 soldiers from the regiment will be exercising their right to march through the town, as the Freedom Charter allows. The Duke of Wellington’s Regiment was granted the freedom of the former County Borough of Huddersfield in 1952. Kirklees Council granted the passing of this honour to The Yorkshire Regiment on its formation in 2006. The soldiers will be received into the town by the Mayor of Kirklees Councillor Paul Kane and the Vice Lord-Lieutenant of West Yorkshire, Mr Tim Hare. The Mayor will pay tribute to the regiment, which has a long and proud history and roots embedded in the old West Riding of Yorkshire. The Freedom Parade in Huddersfield will be followed by a further parade in Halifax. From 10.30am – 12 noon there will be rolling road closures along the route. It’s the only regiment in the British Army that retains its County title and identity, its permanent connection with Yorkshire goes back to the 17th Century. Since that time Yorkshiremen, by birth and in spirit, have served with distinction and success all around the world. For the first time since its formation in 2006, a regular battalion of The Yorkshire Regiment will be based ‘at home’ in Yorkshire alongside the county-based Army Reserve Battalion. Catterick will be the home of The Yorkshire Regiment for the next six years. The 2nd Battalion regulars and the 4th Battalion reserves practice, train and deploy together as a paired and integrated force called the ‘Yorkshire Warriors’. You can find out more about the Yorkshire Regiment at The York Army Museum, the new museum on Tower Street has been transformed into a contemporary, exciting and interesting military museum and York attraction, thanks to the generous award of a £1million Heritage Lottery Fund (HLF) grant.